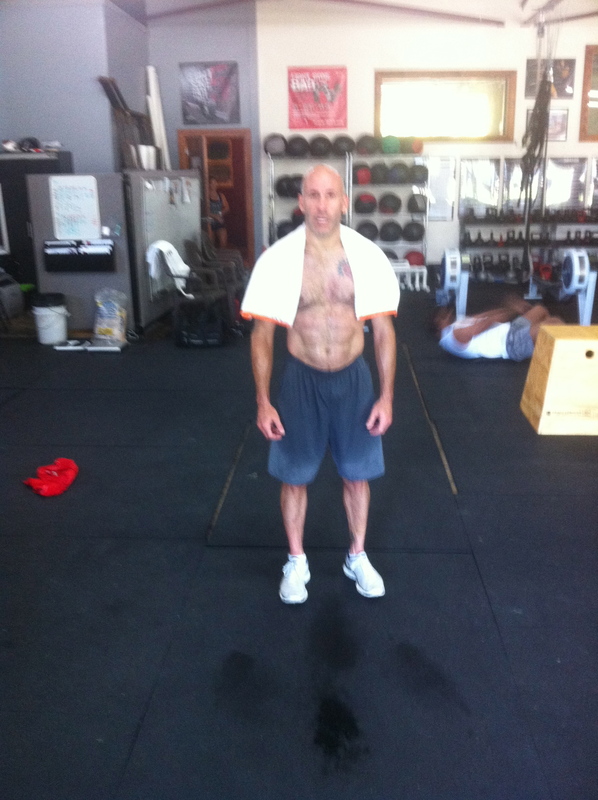 A 3000m row, 150 burpees, 150 (24″) box jumps, and a 1.5 mile run. That doesn’t sound all that challenging, right? 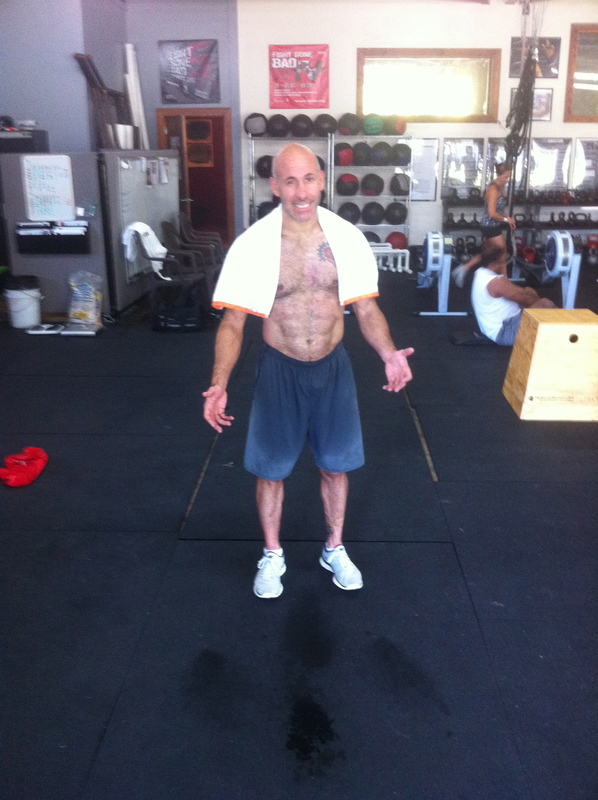 However, when it’s done in 3 rounds of 1000m row, 50 burpees, 50 box jumps, and 800m run, it is exceedingly challenging. As well it should be. As today is the 10th anniversary of the 9/11 attacks, athletes at CFD completed the Hero WOD “Small”, named after S. Army Staff Sergeant Marc Small. I arrived at the gym early to set up the rowers and boxes as well as to stretch prior to this WOD. Let me once again state that doing a WOD solo is challenging for a number of reasons, including having to provide one’s own direction and support as well as the inability to gauge your performance as compared to others. Given how competitive I am, I always do better when I’m running neck and neck with someone. Not an excuse, I know. I set one and only one goal: complete the WOD in under 50 minutes. I rowed at about a 1:56/500m pace and stroked a mere average of 24 strokes/minute. The burpees were a challenge right out of the gate, and I completed at the most only 15 unbroken. For the second and third rounds, I often completed in reps of just 5. I focused on form for box jumps, pausing briefly at the top and jumping quickly when my feet touched the ground. I completed 20 at the most and 5 at the least, but was often able to string together at least 7. Running was active recovery, and felt downright easy compared to the other activities. I completed the first round in 15 minutes. I’m not sure what my time was for the second round, but I did finish in 45:46; thus, I slowed down somewhat, but not dramatically. There were at least a half a dozen occasions when I thought I was going to hurl. I was breathing far too heavily, and had a difficult time making myself move from 1 round to the next or 1 activity to the next. Grueling. Again, as well it should be. Take your time on the recovery! You’re bending your knees too soon! Full extension at the top! I want to see you jump! Extend your hips at the top of the box! After the WOD, Troie said, “I really wanted you to just leave me alone during the WOD, Paul.” I can understand why, as I was on him like white on rice. Again, I have to be careful with over-coaching. Troie, et. al., let me know if I’m doing so and I promise to back off. A little. 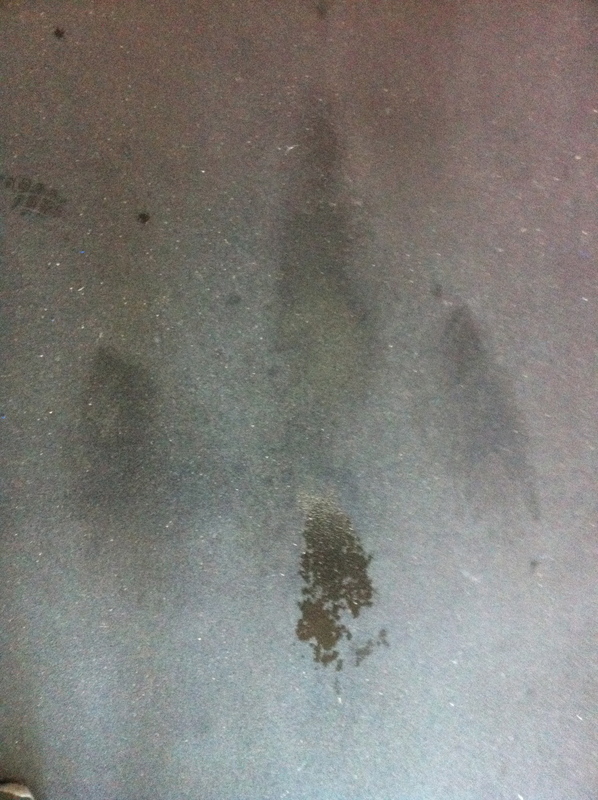 Sweat from head at bottom, hand prints to side, chest down center. Next ›Double unders? Yeah! 1-arm KB swings? Boo!